To get to the new privacy and security hub, open Gmail or a Google search page while signed in. Then click on your account picture and select Account from the drop down menu. You can also access the new dashboard at myaccount.google.com. The new dashboard has three major sections: sign-in & security, personal info & privacy, and account preferences. Each section has all the services you're familiar with if you've ever delved into the deep settings of your account before. Under sign-in & security, you can do things like change your password, manage app-specific passwords and connected apps, set a recovery email address and phone number, and check how many devices are connected to your Google account. 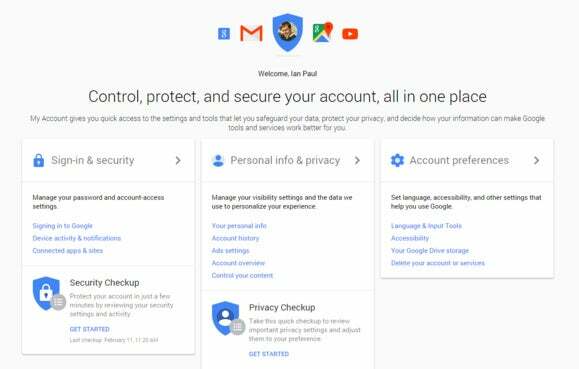 The privacy section controls your account history, lists the Google services you use, and lets you download your personal data via Google Takeout. You can even set an account trustee to manage your account in the case of death, long-term imprisonment, or any other situation where you can't get online for an extended period of time. Finally, you've got your account preferences to set your preferred language, manage Google Drive storage, delete your account, and so on. This is the second major privacy announcement from Google recently. During Google I/O the company also announced that Android M, the next major version of Google's mobile operating system, would provide granular permissions for third-party apps. In addition to the new privacy hub, Google also rolled out a new FAQ site on Monday to answer privacy- and security-related questions. The impact on you at home: With so much anxiety about the amount of data Google has on you, it's good the company is making it easier to get at that information. This will become even more important for Android M users with upcoming features like Now on Tap—Google Now context for mobile apps—that will require Google to store even more information about how you use your device, your personal information, and the content you consume.